Very detailed histories of the Methodist Church in Sunbury have been written by Ruth Truxall Domigan in 1964 and by Esther McCormick in 1982. I have chosen some highlights to entice you into further reading in these books, both are available in Community Library. Circuit riders brought the first Methodism to our communities. A circuit had 12 preaching places over a 100 mile trek which the preacher covered every two weeks, stopping to preach at 6 places per week on a regular schedule. Services were often held on weekdays when preacher was in your community. Some circuits had 24 preaching places, covered 200 miles and 2 riders to service the large area. All the preaching places were organized into classes which were overseen by a Class Leader. The Class Leader held Sunday services in a home, kept the group informed of the circuit rider's schedule, visited the sick, etc. If the Class became too large to meet in a home, it was divided and those multiple classes formed a Society. Eventually the Society built a church. Alexander Cummins was the Delaware Circuit Rider from 1811-1812 and was paid $113.11 for his labor. In 1838 the first Methodist Church was built on North Columbus Street next to the cemetery on land owned by Allen and Catherine McLane. The deed dated December 24,1842, states the Protestant Episcopal Church and the Methodist Episcopal Church of Berkshire Township, Delaware County, Ohio, paid $100 for the site of the Methodist Meeting House. the building was constructed for $1,500. It was a single rectangular structure with windows on each side and two doors in the front which opened into the vestibule with stairs leading up to a balcony and a door opened into the sanctuary. By 1899 it was apparent the church was in bad repair. By tearing down the old church, reusing the beams and using as much donated time, labor and materials as they could, the congregation built a new church valued of $5,000 for $3,500. Even Pastor Martin weaver donned overalls and worked with the carpenters. It is likely the second floor of the Town Hall was used as the place for worship as the building was built. The Aid Society of Ladies' Aid were busy raising money for the church and helping those in need. The Spinsters' Convention was one of many events during this time. 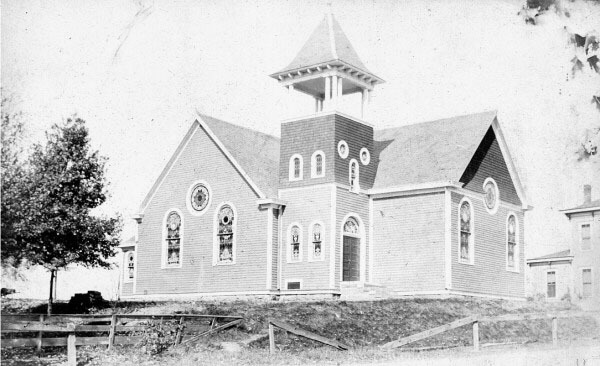 The new church was dedicated October 6, 1901. Not only was it larger, it had stained glass windows, gas lights, a coal furnace, a large Sunday School room in the front which had folding doors into the sanctuary so it could be used for large services. At the time of dedication, there was a debt of $1800 owed on the building. Pledges after the service amounted to $1,230 and following the evening service the entire sum had been pledged. In 1906 the church was debt free. In 1910 a parsonage was added to the minister's salary of $1,000. The same year a piano replaced the pump organ. Two years later the church acquired a new addition, "the choir room" which was planned for the women was taken over by the men - a sore point for many years among the ladies. Many years later it was turned over to the teenagers. intersection. 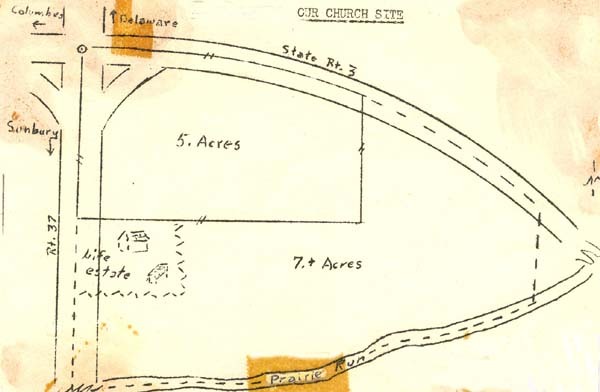 On January 27, 1960, Mary Ellen Miller offered the church of land extending from Prairie Run to the Route 3,and 37. Five acres were given by Russell and Mary Ellen miller and their son Paul. the remaining seven acres of the tract was purchased for $5,000. (Mrs. Sarah Giles had a life lease in the house on the property.) 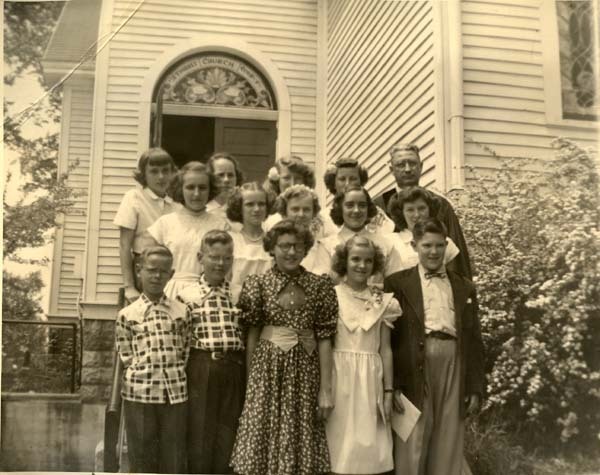 By December 1960 the congregation raised $2000 to go with the $3,000 grant from the Conference Board of Missions so the land was deeded to the church. Mrs. Giles died in the spring of 1964, so the church rented out the house. Also in 1960, Mr. and Mrs. Ted Forman gave the church a lot on Baughman Street for a new parsonage, freeing up the old one to me used as a parish house and to provide additional classrooms. The new parsonage was completed for $13,000 and opened on March 5,1961. A pot of left over sloppy joes triggered a chain reaction ending in the construction of a new church.